Viruses and their hosts are in a perpetual state of evolutionary war. Host organisms try to find ways to get rid of their parasitic interlopers, while viruses develop countermeasures to evade rejection. It's a biological arms race that often results in some pretty strange innovations. But Tufts University researchers recently uncovered an adaptation they could only describe as "remarkable": a virus that captures its host's immune system, which it then uses for an ensuing attack. The study, which now appears in Nature, is the first to ever show that a virus, in this case a bacteriophage (or just "phage"), can acquire a fully functional and adaptive immune system. It's a discovery that threatens to complicate the debate over whether viruses are a form of life or simply complex streams of DNA or RNA. The discovery was made by Andrew Camilli, Kimberley Seed, and colleagues while analyzing DNA sequences of phages — ICP1 in particular — taken from stool samples from patients with cholera (Vibrio cholerae). To their surprise, they found a set of genes called CRISPR/Cas within the phage that codes for a fully functional immune system — the kind only found in some bacteria (and most Archaea). They decided to verify the discovery by taking a phage that didn't have the adaptive immune system and setting it loose against a new strain of cholera bacteria that's naturally resistant to it. The phage failed. Next, they took the CRISPR/Cas-enhanced phage and set it against the same cholera — but this time it adapted and gained the ability to infect — and kill — the cholera bacteria. Which is not necessarily a bad thing. We are talking about the bacteria which gives rise to cholera, after all. Essentially, CRISPR/Cas is being used by the phage to adapt to and overcome the defense systems of the cholera bacteria. Normally, CRISPR/Cas provides sequence-specific protection from invading nucleic acids, including phages. But as far as ICP1 is concerned, this was a twisted turn of events. Armed with its host's immune system, the phage can kill the cholera bacteria and multiply to produce more phage offspring — which then go on to kill more cholera bacteria. It does this by targeting and destroying specific inhibitory genes of the host cell by cutting the target genes into pieces. It's by disarming these genes that the phase can also disarm the host cells, allowing it to infect and kill them. Essentially, the phage is using the CRISPR immune system to attack its host's virus-attacking genes. Prior to this study, scientists assumed that viruses were too basic or primitive to have their own immune system. It's worth noting, however, that the phage is not actually producing its own immune system; it doesn't have the genetics for it. Instead, it has to capture one, effectively parasitizing another organism's genome. As to whether or not this constitutes a genuine lifeform remains an open (and possibly unanswerable) question. But the discovery is also interesting in that it could lead to phage therapy — the use of phages to treat bacterial diseases. 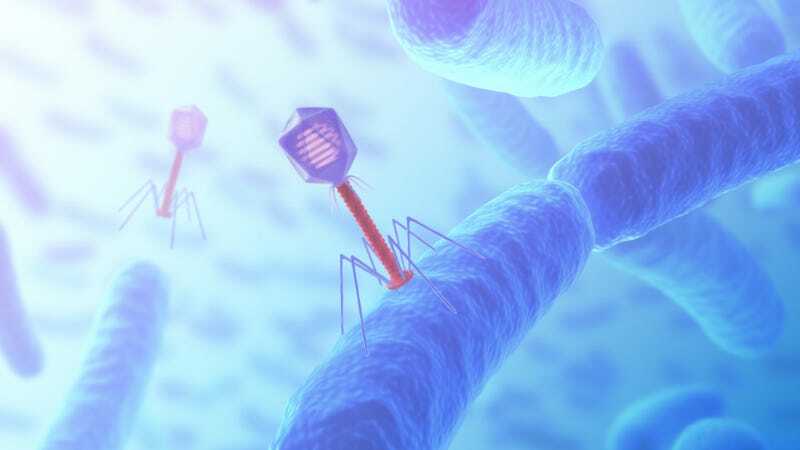 Given the rise of so-called superbugs and the ever-decreasing effectiveness of antibiotics, an advanced genetically designed phage therapy could prove to be the intervention we're all waiting for. But as far as the bacteriophage is concerned, that would mean war. Check out the entire study at Nature.